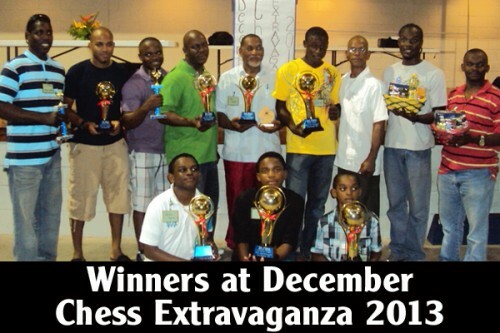 The DCE (December Chess Extravaganza) 2013 Swiss Tournament is now history. Twenty participants took part in two categories, nine in the junior and eleven in the senior. The turnout was rather unexpected, because of the very high number of those who pre-registered. However, the twenty participants gave good account of themselves. In the junior section, participants ranging in age from seven to eleven played their hearts out. From round one to five, their focus/attention was on their game. Upsets with their losses were mingled with happiness in their victories. The upset game of round one was between young Akeem Roches and Alexander Musa, who came in first and second, respectively, in the tournament. It lasted six minutes. Young Akeem, in Creole parlance, was “in his thing.” He was cool, as he moved his pieces across the checkered board. Alexander was noticeably uncomfortable. Fifteen moves after the game started, it was over. Of interest in round one was the game between two of the female players, Philany Palacio and Evian Berges. Both girls went after each other aggressively. After nineteen minutes, Philany emerged as the winner. At the end of the tournament, Evian received the Best Sportsmanship award and Philany the Best Female award. The other upset in the junior category was in round three between Julian Young and Alexander Musa. Julian, who got the award for being the Youngest player, gave good account of himself in the game. Their game lasted eighteen minutes. Julian displayed a lot of patience and beginner’s chess acumen, not venturing into complications that his opponent tried to snare him into. It was an interesting game to watch. At the end of the game, Julian outplayed Alexander and ‘mated him. Interestingly, Mohit Vanjani, who got the award for being the Most Aggressive player, fought valiantly, but couldn’t get by Akeem in round five. The game that many would have wanted to see would have been between Julian Young and Akeem Roches; but it was not to be in this tournament. In the final analysis, Akeem Roches, Alexander Musa, Nigel Matus and Samron Pott came in first to fourth, respectively. It was brutal in the senior category, as all eleven players were viciously attacking and counter-attacking each other. Deep strategies, ultra-modern tactics, sophisticated combinations, decisive attacks, and much more were the order of the day. First move was made at 10:21 a.m.; thereafter, the players went after each other relentlessly. Upcoming master Steve Flowers fought a long grueling battle with arguably one of Belize’s strongest players, Major Charlton Roches of the BDF. Each move was calculatedly thought out. At move 45, Major Roches, ahead in time by almost four minutes, went into a very complicated tactical maneuver; his young opponent and protégé knew not how to respond. As Steve reflected on the task in front of him … how to withstand the onslaught … he remembered one of the old chess adages – when confronted with a complicated situation, aim for simplification. Unwittingly, it was a wise decision. Somewhere along in his moves, he made a counter strike and turned the tide of the game in his favor. After that, he maintained the initiative and defeated his opponent. The end game was a beauty to watch. Major Roches played brilliantly, but his young opponent, seeing the myriad of mines across the checkered board that he laid out for him, kept his mind on non-explosive tactical plays. And then the end was in sight; Major Roches realized that victory in game one was not to be his, smiled and acknowledge his only defeat of the tournament. In this round, Dante Reneau played a very good game against Fareed Ahmad. The game went to the bitter end, with Fareed having a king knight pawn and his king against Dante’s lone king. Dante gave up the opposition to Fareed and lost. It was obvious, he never played a game down to three pieces, and had to maneuver his king to gain the opposition. Fareed’s experience, which was key to his winning, showed itself in the game, which, earlier, Dante could have won. All other players played cautiously. As we entered into game two, one could feel the chess tension rising, especially for Steve, who played one of the two veteran players in the tournament, Jeff Scott. It was a heartfelt loss for Jeff, who did not underestimate his opponent. He made one fatal error, that of not reading a zwischenzug play (an in-between move). Shortly after, young Steve, who was on a chess high by this time, won his second game. Round three started with the players playing sharp tactical plays, realizing that this round was crucial to their awards challenge. Despite all their chess emotional upheaval, there was one noticeable upset; it was the game lost by veteran player Jeff Scott to Dante Reneau at move twenty-seven. He lost his game by a technicality. Steve Flowers and Major Roches held on to victories. So far, the other veteran player, Kofi Geban held on to his three wins. In game four, we saw Kofi Geban and Steve Flowers face each other. It was a do or die for Steve. Knowing that his opponent is one of Belize’s best on the chess board, Steve approached his game with some trepidation against Kofi Geban. Both players started out cautiously. Then Kofi started to turn on the middle game heat, of which Steve couldn’t handle. He tried desperately with some counter attacking moves, but the veteran, who is one of yesterday’s visionaries and today’s stalwarts, defeated Steve in the end. Meanwhile Major Roches was whipping up a chess storm against Captain Kenrick Martinez of the BDF, taking no prisoners. Then came the decisive round five! It was a blowout for chess lovers. The best of the best sat down to duel it out. Undefeated Kofi Geban and wounded Major Roches from round one. Both players sat down comfortably facing each other. Then Kofi Geban started Major Roches’ clock. It was obvious that from play one it was going to be a rough chess ride for both chess combatants. Play after play, both players played decisively, giving up no un-fought for material or accommodating any positional advantage. Kofi needed a draw to win the tournament, and Major Roches needed a win to stay in contention for top honors. Both players, realizing their needs, played outstandingly. It was in the end game that we saw the brilliance of Major Roches on the chess board. Looking several moves deep, he demonstrated calmness and chess dexterity on the board. Being a pawn down and running out of time, he maintained his cool, of which chess masters are known for. Then Kofi got himself in a zugzwang position and the end was in sight. So, he too smiled and accepted defeat. Then it was over, after fifty games and approximately twenty-five hours of playing time. At the end of the tournament, Steve Flowers, Kofi Geban, Major Charlton Roches and Captain Kenrick Martinez, also of the BDF, won first, second, third and fourth places, respectively. As we look towards 2014 and beyond, the Belize District Chess Association is excited about its slate of activities which will be announced in future articles. However, slated for its first official 2014 event is the Battlefield Park Blitz Tournament, January 19, 2014, starting at 3:00 p.m.